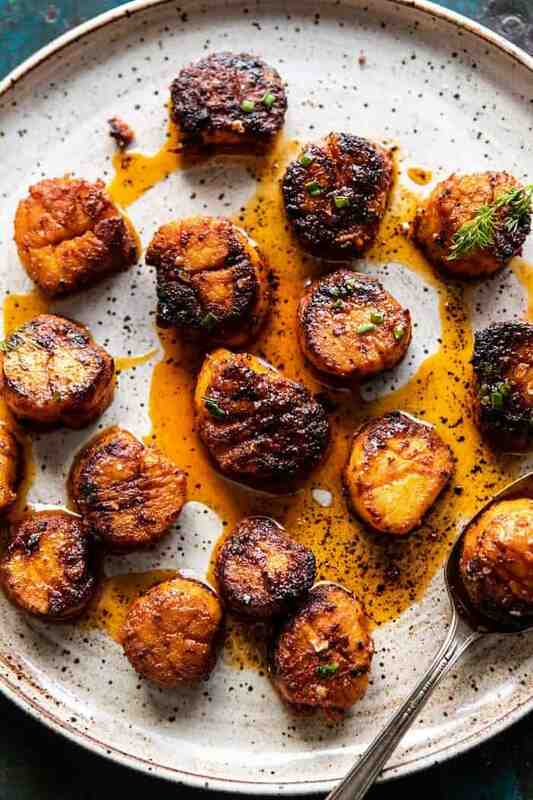 Honey Butter Blackened Scallops with Herby Polenta. 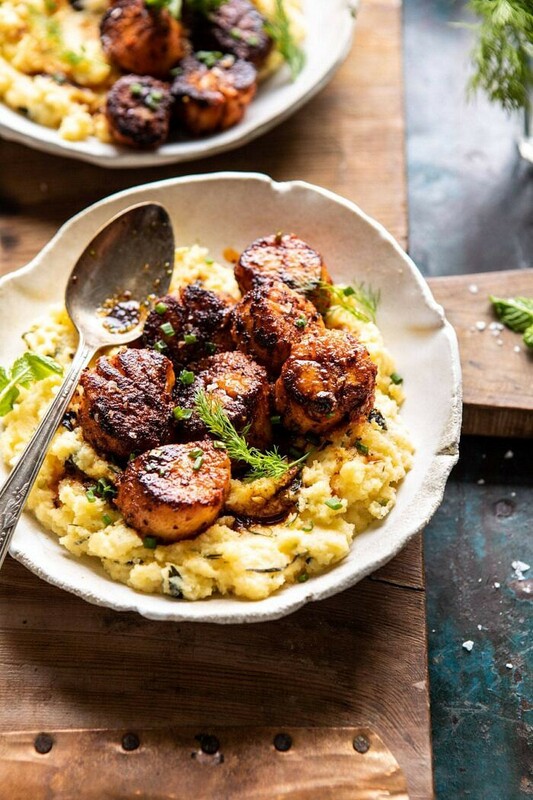 These Honey Butter Blackened Scallops with Herby Polenta are simple and delicious. 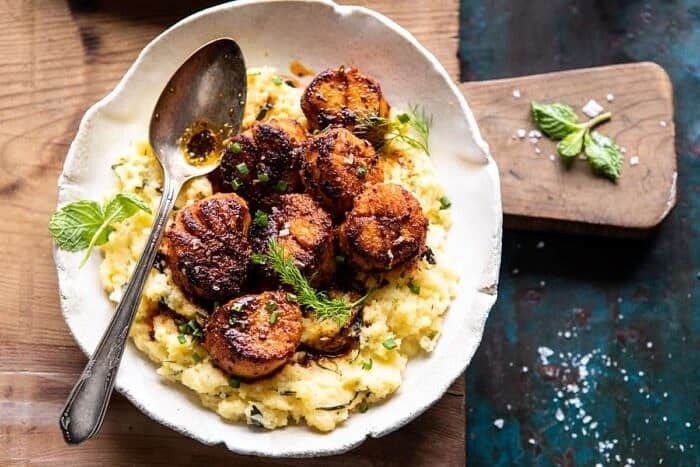 Pan seared scallops tossed with spices, honey, and a touch of butter, then served over a creamy herb swirled polenta. Serve with a simple salad and you’ll have a quick and easy skillet dinner that’s full of flavor. The perfect meal to welcome in spring! Happy first day of spring! Wow, it’s insane to me that winter has come and gone and we are already moving right into spring. I’m very excited to be slowly heading towards warmer days. With warmer, longer days comes fresher recipes, more color, and new flavors…all things I love! That said, we still have so much snow here in Colorado, so I’ll being sharing a combo of cozy and fresh recipes. Kicking things off today with seafood! Like clockwork, spring rolls around and I’m ready for salad, seafood, and veggie filled dishes. Are you guys the same way? What foods/recipes are you looking forward to enjoying this spring? But, I just got word that our family is planning a mid April vacation. Not exactly sure where to yet, but I have to say that I cannot wait. By then I will (fingers crossed) have turned everything in on the project I’m working on (that may or may not be the death of me…). So the trip will be perfect timing, and is really giving me something to look forward to! OK. So these scallops, let me tell you all about them. I made these scallops a couple of weeks ago, but waited to share until today. Even though the recipes feel springy, they still have a cozy element thanks to the creamy polenta. This dish has the perfect balance for this time of year when the weather is trying to be warm and bright, but has it’s dark and dreary days too. As mentioned, this recipe is pretty simple (which is totally what we ALL need right now). I tossed the scallops with a good amount of smoky paprika, cumin, garlic and lemon. I love this combo of seasonings so much, and if you’ve been watching my Instagram stories, you know that smoked paprika is my secret ingredient when I want to add flavor to just about any dish. 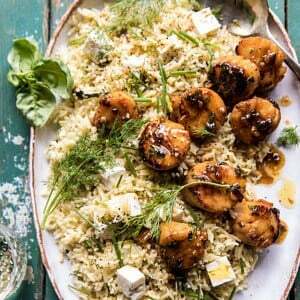 These scallops are a touch smoky, a little spicy, and balanced out with some citrus. I pan seared them to give them a really nice crust, then tossed in some butter and honey to create a little sauce. Especially when paired with a creamy polenta, which I’m now thinking all scallops should be served with. I mean, the two are such a good paring and give the dish a touch of southern flair. For the polenta, I wanted to keep it simple, but give it a pop of freshness. Enter the herbs. It’s really no secret that I love fresh herbs, but come spring and summer months, I’m using them non-stop. Herbs can really add so much flavor and color to a dish, taking it from bland to beyond delicious. Which is exactly what they’ve done for this polenta. Don’t get me wrong, polenta is great on its own, but it can be just a smidge on the bland side. I used a mix of fresh basil, dill, and chives, then stirred in a couple spoonfuls of Crème Fraîche to make the polenta extra creamy, and a touch indulgent too. I’m loving serving this dish with a simple salad or roasted asparagus and artichokes to add in some spring vegetables. In the summer, I will definitely be making these scallops with burst cherry tomatoes and grilled corn. Already excited about it. 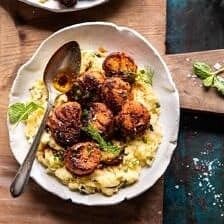 If you make these blackened scallops, be sure to leave a comment and/or give this recipe a rating! Above all, I love to hear from you guys and always do my best to respond to each and every comment. And of course, if you do make this recipe, don’t forget to also tag me on Instagram! Looking through the photos of recipes you all have made is my favorite! 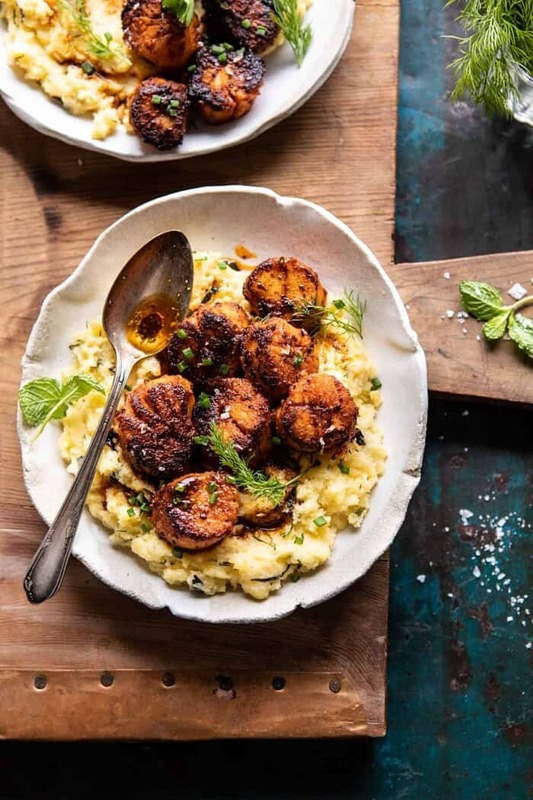 Pan seared scallops tossed with spices, honey, and a touch of butter, then served over a creamy herb swirled polenta. Serve with a simple salad and you'll have a quick and easy skillet dinner that's full of flavor. 1. Pat the scallops dry. In a medium bowl, combine the scallops paprika, cumin, garlic, crushed red pepper flakes, and a pinch each of salt and pepper. 2. Heat the olive oil in a large skillet over high heat. When the oil shimmers, add the scallops and sear on both sides until browned, about 2-3 minutes. Add the butter, and honey. Cook until the butter is golden and the scallops are opaque, about 3-4 minutes. Remove from the heat, add the lemon juice. 3. Spoon the polenta into bowls. Top with the scallops and a sprinkle of fresh herbs. Squeeze lemon juice over top. Enjoy! 1. In a medium saucepan bring 2 cups water and the milk to a boil over medium heat. Slowly whisk in the polenta, stirring until the polenta is soft and thick, about 5 minutes. Stir in the butter, creme fraiche, and herbs. Season with salt and pepper. Serve warm. 20 Minute Honey Garlic Butter Scallops and Orzo. 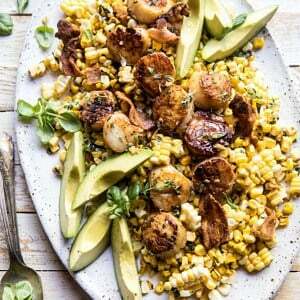 Brown Butter Scallops with Corn, Bacon, and Avocado Salad. I love scallops, been a while since I last indulged! I am such a fan of smoked paprika! And I totally agree that they add so much flavor (and color) to any savory dish. I love that you added the polenta to this dish. What a GREAT transition into Spring. Which, I think everyone is so desperately ready to get to. Thanks so much for always sharing such amazing recipes. I LOVE scallops but my boyfriend does not. Would this be as amazing with shrimp? And scallops (for me, of course). This looks amazing! I’ve always been a bit intimidated by scallops even though I know they’re simple to prepare. Do you have a pan recommendation that is best to get that perfect scallop sear? well..the scallops look good, Tieghan, but I do not know what polenta is. I don’t think we have that in Canada. Is it grits? (Which we don’t have that either..lol), Is it made out of cornmeal? blackened scallops and creamy polenta, very nice, somehow I always botch my scallops so will try again here since I love this dish, thank you! I just made this with chicken instead of scallops and it was delicious! I used the spices/lemon/olive oil as a marinade and let it sit for 30 minutes (I added a little more olive oil than what it called for). That smokey paprika is so good! And the polenta was awesome! I used thyme and rosemary as the fresh herbs. Thank you for always posting delicious recipes!! Show much water, in addition to the milk, do you use for the creamy polenta? Oh my word. I made this tonight for myself since my family does not like seafood. I loved it. My first time having polenta and I love it. Next time I will add just a little bigger pinch of red pepper flakes. Loved it. I just made this recipe and the scallops turned out great! The only polenta available at my King Soops today was the pre-made tube kind. Any suggestions working with this kind of polenta? Made this last night for me & my husband and it was DELIGHTFUL! I LOVE HBH site because you offer so many amazing vegan & non-vegan options. All simple with good, fresh ingredients that can make a fabulous, quick meal. I swapped shrimp for scallops in this recipe as the scallops looked incredibly sad at the store (and the shrimpers were on sale anyway!!). Also used soy milk instead of whole milk in the polenta and it turned out just as creamy. 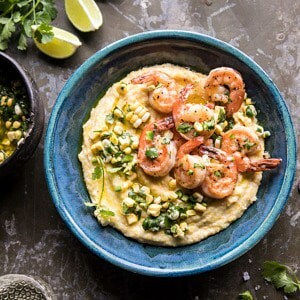 My sweet southern husband said, “this is the best shrimp & grits I’ve ever had!” Polenta is basically Italian grits, right!? 😉 Thanks for all your greatness! made this, and OH MY G! it is sooooo so good, I wish I had remembered to take a picture 😉 Definitely a great recipe. 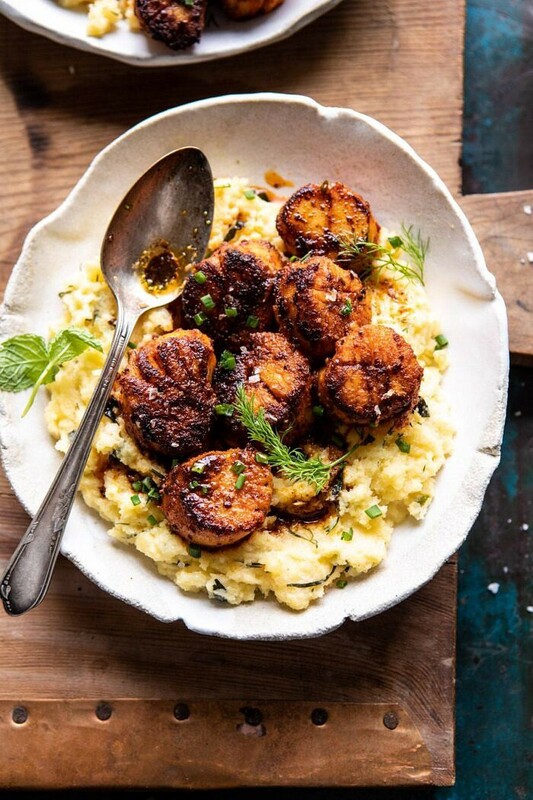 I love the sound of scallops with creamy polenta – can’t wait to try this! This sounds so good, I’m going to go buy scallops tonight. Cumin has become my new favorite spice and I never thought to add creme fraiche to polenta. I can’t wait to try! Scallops are one of my favorites of seafood. Many thanx for the recipe, Tieghan. 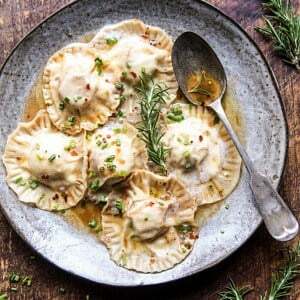 I am making these tonight and just had a quick question – do you toss the juice of 1 lemon in before you sear the scallops or only squeeze the lemon juice over top? The recipe calls for juice of 1 lemon and in your post you mentioned adding it before hand, but the instructions don’t mention it til after they’re cooked! I made these for a dinner party about 3-4 weeks ago and they are on my Easter menu! Absolutely delicious! Again thanks so much for another perfect recipe. 5 Stars, Awesome!! Very simple to make and delicious. Just as good as any restaurant would prepare. Will definitely make again.